Behavior charts with butterflies! Your children will love our butterfly theme behavior charts! 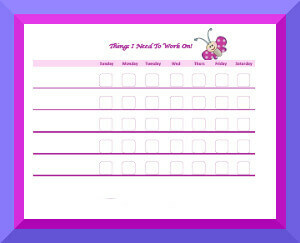 Behavior charts are great tools to teach children behavior management, daily routines, and chore tracking. Using behavior charts with fun themes will be an extra bonus! Check out our other themes, and if you need a special type of chart that you don't see on our site, let us know. We'll make it for free!